Amazon rolled out a new mobile point-of-sale service today dubbed Amazon Local Register that competes directly with Square and PayPal to push retailers and merchants to accept in-store transactions through a smartphone or tablet. Amazon’s technology gives the company a stronger inroad into bricks-and-mortar retail, which still accounts for approximately 90 percent of sales. 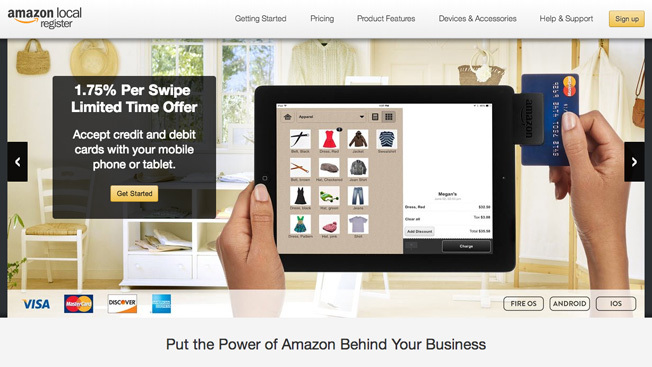 Amazon Local Register operates similarly to other payment services. Local businesses can begin accepting mobile payments by first creating an account and downloading an iPhone or Android app. Merchants then need to buy a $10 card reader that fits into the jack of a smartphone or tablet. As more mobile point-of-sale services enter the marketplace, Amazon is banking on its ecommerce reputation to persuade consumers to start paying with electronic payments versus physical wallets. While online shoppers are accustomed to paying with Amazon, retailers and merchants are notorious for not wanting to work with Amazon. After all, Amazon is credited with spearheading showrooming, where shoppers look at merchandise in stores but then buy it online. To that point, Amazon’s new mobile payment service tries to win over retailers with low transaction fees. Amazon Local Register will initially charge businesses a 1.75 percent transaction rate through Oct. 31. Then, the service will switch over to a 2.5 percent transaction rate. To compare, PayPal and Square charge merchants a roughly 2.7 percent fee. Amazon also has a trove of data on online shopping habits in which retailers are interested. According to the company, Amazon Local Register will give merchants information on which products are most popular and when people are shopping. Whether that’s enough to convince retailers to work closely with Amazon remains to be seen, but it certainly indicates that Amazon’s not content sticking to purely ecommerce in growing its business.